This rich and delicious ham and asparagus quiche is crustless, making it a perfect low carb lunch or dinner option. The addition of leeks and Gruyere cheese add tons of flavor and these ingredients can be changed up according to season. Thanks to the National Pork Board, I have ham leftovers before Easter this year! I was given a free ham for myself and the opportunity to give away a ham to one of you – just in time for Easter. While there are a million ways to use leftover ham, I think one of the best is to bake it up in an easy crustless quiche. I decided to brighten up my usual ham and cheese quiche with some tender green asparagus. I know that ham and asparagus are a classic combination, but this was my first time making a ham and asparagus quiche. The ham and asparagus quiche is very easy to make. First I sautéed some leeks and the chopped asparagus until tender. Then I stirred in some cubed ham, just to blend all the flavors. Next, I scraped the ham and asparagus mixture into my buttered quiche dish. I sprinkled a generous amount of shredded Gruyere cheese over the ham and asparagus. 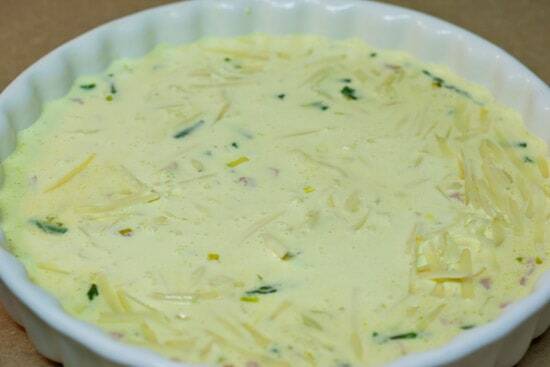 And finally, I poured a rich custard of eggs and heavy cream over the filling. The quiche went into a preheated 400-degree oven and this is what emerged 30 minutes later. 1. Butter a 9- or 10-inch pie plate or quiche dish. Position oven rack to center position and preheat to 400 degrees. 2. Heat a large skillet over medium heat. Add olive oil and butter and swirl to melt butter. Add leeks, and cook, stirring, for a couple minutes until softened. 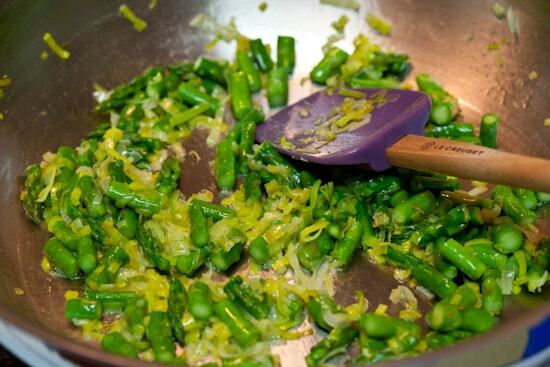 Add asparagus, and cook, stirring, for 5 - 8 minutes, or until just tender. Turn off heat. 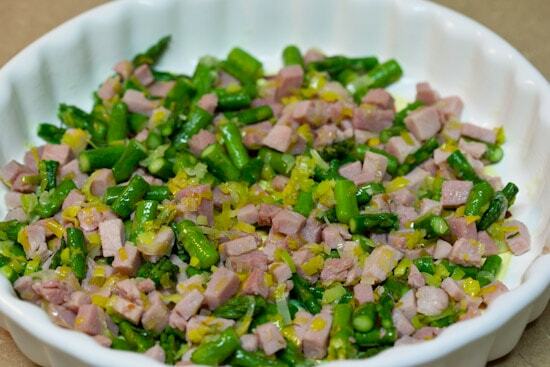 Add ham and toss together with asparagus. 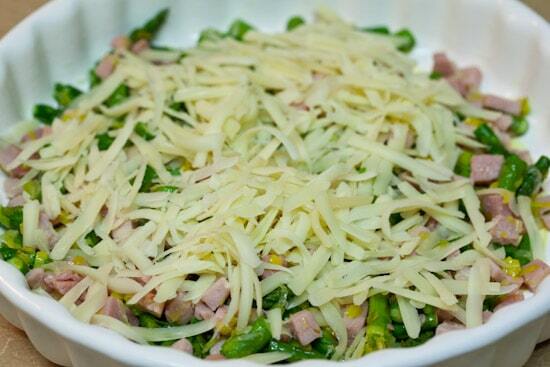 Scrape ham and asparagus mixture into the buttered quiche dish. Sprinkle grated cheese evenly over the top. 3. In a medium bowl, whisk together eggs, heavy cream, salt, and pepper. Pour egg mixture over the ham, asparagus, and cheese. Place quiche in the oven and bake for 30 minutes or until quiche is set and a knife inserted in the center comes out clean. disclosure: The ham I used in this recipe was provided to me by The National Pork Board, but I was not compensated in any other way and the recipe and views expressed in this post are my own. I liked your Facebook page and would like to enter the drawing. I love a classic grilled ham and cheese sandwich. I like to use it in an omelet. Leftover ham - let me count the ways. I have two favorites: croque monsieur, and with the bone, split pea soup!!! Sometimes I make ham specifically FOR the leftovers! I don't like facebook, but I also like ham and eggs. I like twitter even less, but am happy for a chance to enter a third time. My son (8)would say his favorite leftover is that he gets a really good ham sandwich for his lunch - usually for a few days. But there is a girl in his class who is deathly allergic to mustard (the seeds), so the sandwich cannot be what it once was. He has discovered that plain ham with GOOD pickles, and some chunks of cheese makes a lovely lunch. Leftover ham is used in sandwiches and bean soup! I like to make a white beam and ham soup with leftover ham. 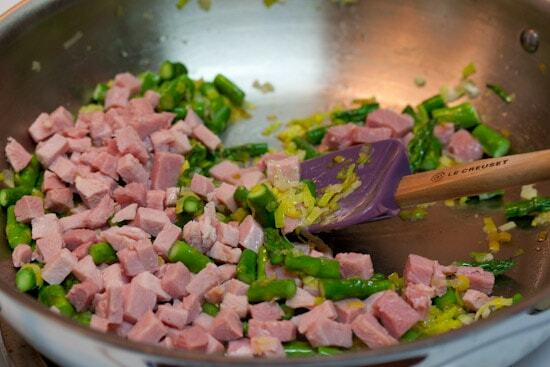 Try some finely chopped ham, green part of scallions added to scrambled eggs made with 4 whites to 2 yolks. Really yummy! My husband loves me to make him ham hash with the leftovers the day after Easter. I "like" you on facebook and I love your recipes! My sons love me to make them ham panini's with swiss cheese and a drizzle of honey. I'm "following" you on twitter too. My absolute favorite way to enjoy leftover ham (or fresh ham for that matter) is in a crepe with a white wine heavy cream sauce and broccoli. A recipe that I have modeled after a favorite dish from The Magic Pan. Heaven!! "Green Eggs and Ham" is a favorite book of my son's but I prefer ham sandwiches, ham stolen late at night from the fridge and eaten with my fingers, curried split pea soup with ham, and potatoes au gratin with slivers of ham. This quiche looks fabulous and is next up on my ham menu. My favorite way to use up leftover ham is in omelets. Quick, easy, and cheap! I love to make quiche, too, but I go for the crusted variety. I am still hopeless at putting together a respectable pie crust, so I use the Pillsbury pre-made ones and it turns out lovely every time.Thanks for the giveaway! Leftover ham.... for me, always ends up in a sandwich. This year I'm hoping I'll have time right before Easter to bake a few loafs of bread and then have completely homemade sandwiches. Crossing my fingers! My mouth is watering just reading this, I can't wait to try it! The best way to eat leftover ham is cold, right from the fridge! You don't need to enter me in the giveaway, just wanted to say how absolutely delicious this looks! I'm with Rachel -- I like my leftover ham straight from the fridge... :)But it looks like this recipe might be a close second! I'm looking forward to trying it. I've liked Pinch My Salt on Facebook. My favorite use for leftover ham is for scalloped potatoes in the oven. I like ham and beans almost better than the ham itself! yum! the quiche looks so good! I like using ham with leftover mashed potatoes and making potato/ham patties, dunking them in egg mixture and panko crumbs and then pan sauteeing them. This looks delicious! I love all the other suggestions for leftover ham too! Very creative! The quiche looks great! I think you hit the nail on the head when it comes to using leftover ham - quiche or casseroles, or at eklase that is my favorite way. I can't wait to try the quiche recipe. Sounds like a wonderful recipe. My after Easter Ham usually goes into Scalloped Potatoes and then Pea Soup. Following you on twitter! Love the updates on there! I love to use leftover ham to make scalloped potatoes and ham. It's YUM! Been a fan of yours on FB for a while now; you're one of my most frequently-referred to food blogs. Now off to follow you on Twitter! Ham and mac and cheese. Definitely going to try this recipe. I have 2 ways that I like to use my leftovers, depending on how much is left. I often save the bone with any meat on it for ham & bean soup or split pea soup. But my family loves it when I make what we call 'ham bits'. It's just like a breakfast casserole - the ham, eggs, bread cubes, mustard, cheese, and I sneak in onions, garlic and some potato cubes, and then bake it. My husband grew up eating ham left-overs this way and has passed his love of it onto my kids, and they ask for it with every ham we buy. I hope I win, since I know my family loves ham! Happy Easter! oh, and I used to love making big pots of soup with my ham leftovers, but by Easter it's already so hot down here in South Florida that I don't do that too much anymore. I tend more towards fritattas now -- just slice up the ham and some potatoes and layer them with whatever other goodies happen to be in the fridge, egg it up :) and bake. Monday brunch! I also cube it up and use it to flavor turnip greens with leeks and a dash of vinegar. Yay! And now I follow you on Twitter, too. All your salt are pinched by me! I love to use leftover ham in a split pea soup. We love ham sandwiches! Also my kids love noodle soup with ham Ponyo style. I love to make grilled a jalapeno cheese sandwich with left over ham with sliced tomatoes and caramelized onions. I like to use ham in omelets and grilled ham & cheese sandwiches. mmm...nummy. Oooooh, that looks delicious!! And low carb too which is even better :)We usually eat our entire ham so what I use is the ham bone for bean soup! I've been following you on Twitter for a long time now. Looks delicious! I can't wait to give this one a try! I follow you on FB, and now I follow you on Twitter.My Mom always used leftover ham to make all kinds of soup.Thank you. I follow you on twitter!!! Enter me please! I liked you on facebook!! Enter me please!! I have been a fan (or like, as they now call it) on FB for quite awhile now! I like to use leftover ham to make omelettes, fritattas, or put in salads!! My favorite way to use leftover ham is in twice baked potatoes, or on pizza, or in soup, or in quiche...it is really quite versatile! I love to use leftover ham for quick breakfasts and lunches then use the bone in soup!! My sister and I are making brunch for the family and a ham would be a perfect addition! btw: you are liked and followed on facebook and twitter :) I adore your blog. Your pictures are so luscious!! Did someone mention a ham competition, I am making this quiche if I win! Happy Spring! Ham is a tradional favorite at our house on Easter. I like to use leftovers to make ham spread using healthy, crunchy ingredients for sandwiches or it is good on crackers. The quiche recipe sounded so good. I discovered Gruyere cheese about 2 years ago, and absolutely love it. I am anxious to try it in a quiche. Thanks. Hey there! :-) I already had you liked on FB; commenting here to let you know. As for how I like to use leftover ham, one of my favorites in red beans and rice. Yummy!I love the quiche idea btw. Asparagus is one of my favorite Spring foods and like you said, it pairs so well with ham. I love satueeing leftover veggies and throwing them into a tomato sauce for pasta! My goodness...leftover ham (if there is any!) is usually used in my home for sandwiches, split pea soup, definitely quiche and omelettes, But I have never made a crustless quiche. Most likely my next quiche will be crustless. Love the thought of less fat. Yum! I'd definitely do split pea soup and a panini with ham and gruyere with a fried egg on top. Soup + sandwich + ham + egg = BLISS!I dont have any ham, but I'm totally making a crustless quiche tonight! I like to make an old-fashioned ham salad with relish in it. My favorite ham leftover is eggs benedict. My mouth is watering just thinking about it! My favorite thing to do with leftover ham is use the bone for bean soup. Also adore frying leftover slices and serving them with poached eggs. And for the third entry, I am already following you on twitter, does that count? This looks delicious! Can't wait to make it.And I liked you on FB! I like to make a lima bean soup with ham with leftovers. I also make a crustless quiche with ham, swiss, and onion. I can't wait to try it with asparagus and gruyere. I love using Ham in my scrambled eggs the day after. Nothing like old school ham salad with some mayo, dill pickles and maybe some shredded cheese from a food processor. Love leftover ham in my mac and cheese, in an omlette, ham sandwich, ham salad or in deviled eggs! Liked you on Facebook. Thanks! Love leftover ham in mac and cheese, with egg salad, in soup, as ham salad, in a sandwich or as part of a chef's salad. Like you on Facebook! ham biscuits!!! that's what i'm craving leftover ham for... buuuuut i'm wondering if it's just cuz i'm craving biscuits. ;) this crustless quiche is also making me want quiche... and the comment above makes me want mac & cheese... apparently i'm hungry and all leftover ham usages are sounding good to me! I love to make a pot of great northern beans with my left over ham. I love leftover ham hash. Particularly good if you have left over scalloped potatoes as well. Naughty deliciousness. My favorite use of leftover ham is to make croquettes. I grind the ham in my food processor & add cheddar cheese, form into balls, dip in egg & additional breadcrumb and fry it up! Oh, and I am also a twitter follower. i use leftover ham in baked potato soup! My favorite way to use up leftover ham is to have my husband make his Fried Pasta recipe. Definite comfort food! I love leftover ham in a hot ham sandwich with swiss cheese, butter, mustard and poppy seed. I like using it like you did, in egg dishes. Also for scalloped potatoes & ham and bean soup! Scrambled eggs with ham, and bean and ham soup. Yum! I already follow on twitter; does that count? Ham with cheesy potatoes is my favorite. I love to make ham and scalloped potatoes with leftover ham! I make ham salad for a special treat. My favorite for leftover ham is breakfast burritos. And, astonishingly, I don't think I saw anyone else mention them yet! Oh, and I "liked" you on facebook! Cold ham straight from the fridge with beets and horseradish, take Me back to Easter with my family as a child! Great recipe - this could easily be done in a skillet, as a frittata, as well. One can never go wrong with the ham/gruyere combo! I use the left over bone in the ham to make a smokey soup stock that I will use for corn chowder, bean soup and/or split pea. All of which can have chopped ham added too.I also use leftover ham in Gratin Daphinoise (also from Joy of Cooking). It turns a side dish into a main dish. When layering the potatoes for the potato au gratin I slip in a slice of ham (cut the same size as the potatoes) like this - two potato slices then 1 ham slice, two potato slices, 1 ham slice, etc. This is a ham/potato/gruyere combo. ham and bean soup or ham and eggs. I like this recipe, simple and clean. I love to make Quiche when I don't know what to make and I am low on provisions. They are so versatile! Nice recipe! Thanks! I follow you on fb and LOVE your recipes! I've made some of your muffins and love your cream of spinach soup. 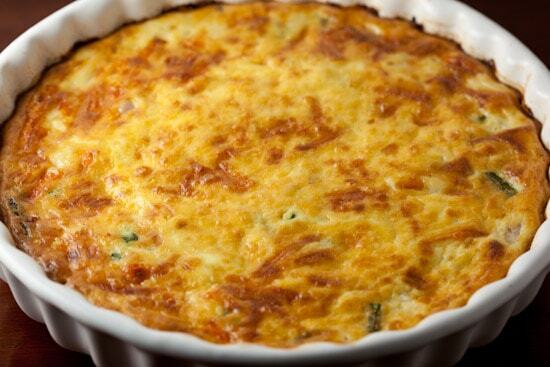 Can't wait to try this quiche for my first time hosting easter brunch! !Hope I am entered to win the ham! Thanks for all you do to help new cooks like me who love to create healthy homemade meals! I usually make soup. Split pea, bean or potato. But excellent ham deserves to star in a frittata or quiche. Favorite for left-over ham is Western sandwiches - on toasted Boston brown bread. Ham and leftover biscuit sandwich! ham sandwiches or ham & eggs! My family's favorite leftover ham use is grilled ham and cheese on homemade bread. I love to make mini ham sandwiches on kings hawaiian bread with my leftover ham. So tasty and easy! I liked pinch my salt on facebook! Mmmmm, this quiche sounds refreshingly yummy.... my favorite way is to make a ham pie- cubed ham, stewed tomatoes, and lots and lots of cheddar in a nice flaky crust. It's addictive! I love leftover ham. 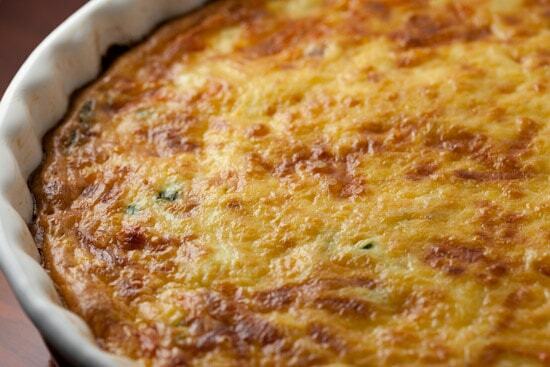 Usually make scalloped potatoes or bean soup, I would love to try your quiche this Easter. Definetly, white beans abd rice. A litlltle "sumthin', sumthin'" extra with andouille. Ham leftovers? Really?? Not in my house!! Well, if there are, they go into green beans for my husband, and an omelet for me! Delish!